Difficulty Notes: A tough trip to rate for difficulty. With expedient and careful routefinding I would say easy to moderate scrambling but very easily becomes difficult and exposed if you go off route. Ax and crampons recommended if there’s snow up high. 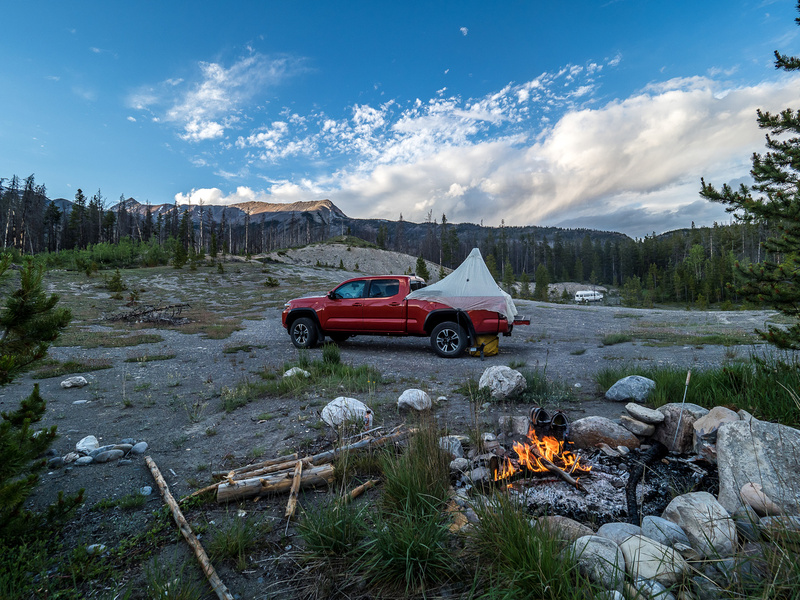 After a recent peak bagging extravaganza in the David Thompson Country area of the Rockies, I’d become somewhat enamored with the free camping, light bushwhacking and magnificent views in the area. When Mike Mitchell and I had to cancel plans to climb Mount Lefroy due to a very high freezing level and Mike not feeling well, we switched objectives to Mount Stelfox and an attempt at Bright Star Peak for Sunday and Monday. I decided that with an excellent weather forecast for Saturday, I might as well do a solo trip and spend another night camping in the area. 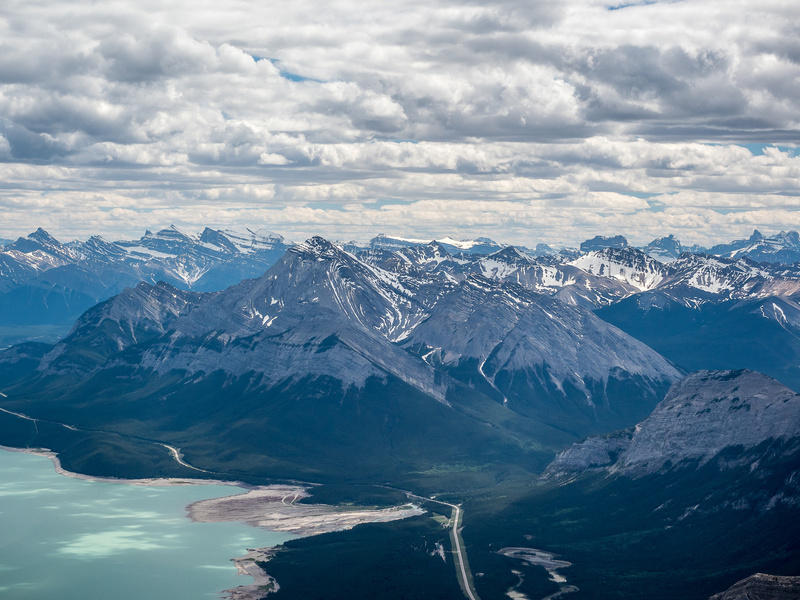 I had a lot of choices left but my top two or three were either some of the 5 Ex Coelis Group of peaks, Windy Point Ridge or Abraham Mountain. The only issue was that I didn’t feel like getting up early on Saturday morning and ended up leaving YYC around 07:30 – pretty late for a trip to DTC which is a 3.5 hour drive from my house. 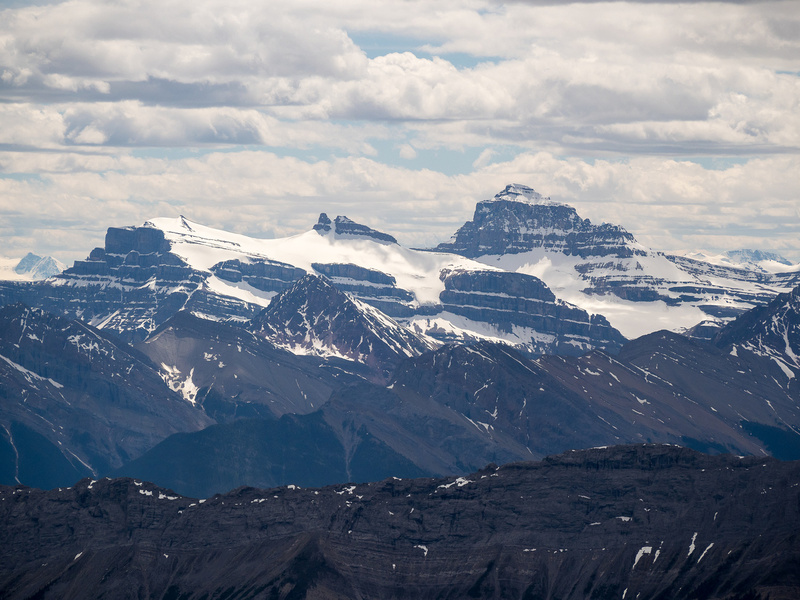 As I drove into the Rockies from Nordegg I was again struck by how lovely the David Thompson Area is and how under appreciated it seems to be by the Calgary crowd of hikers, scramblers and climbers. 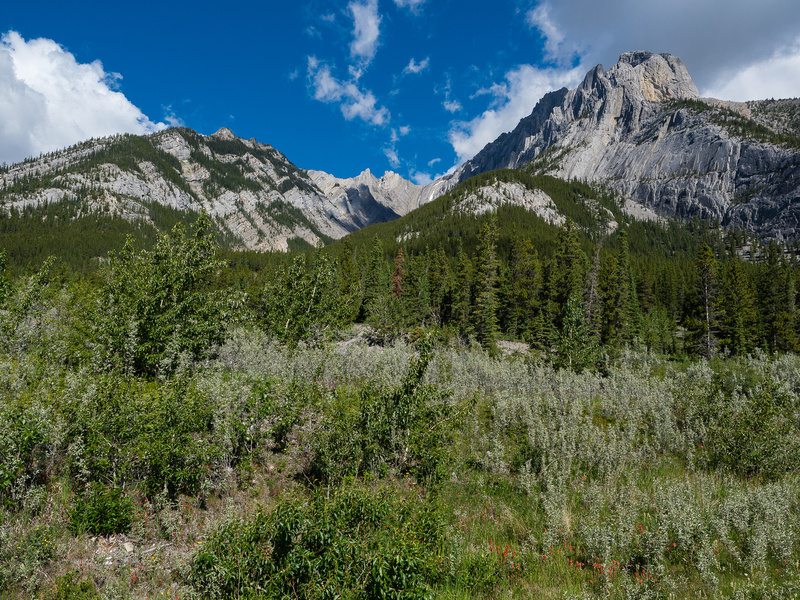 I get it – it’s a long drive for us since we’re spoiled with Banff and Lake Louise being only 2 hours away, or less along hwy 1. 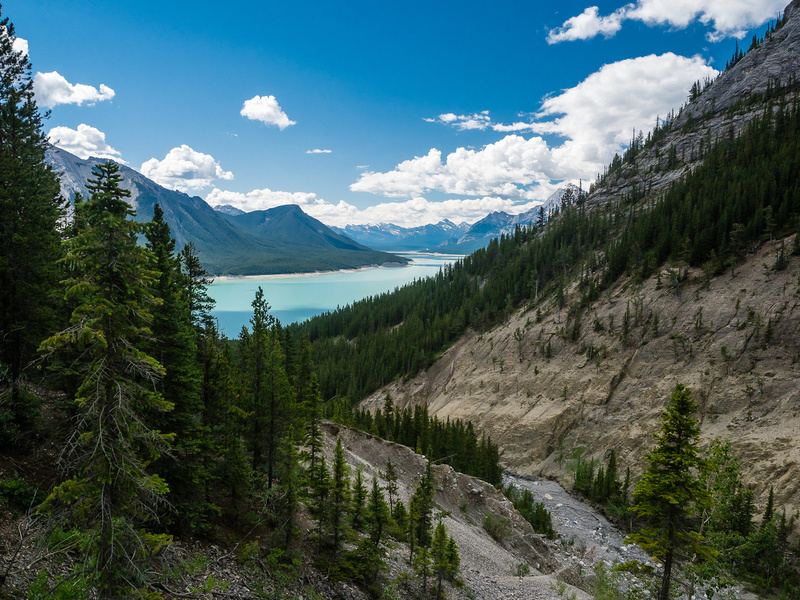 Especially this summer, with Canada celebrating 150 years as a country, I highly recommend escaping the hordes in Banff and Lake Louise and making the slightly longer drive to some unfamiliar country in DTC if you can. 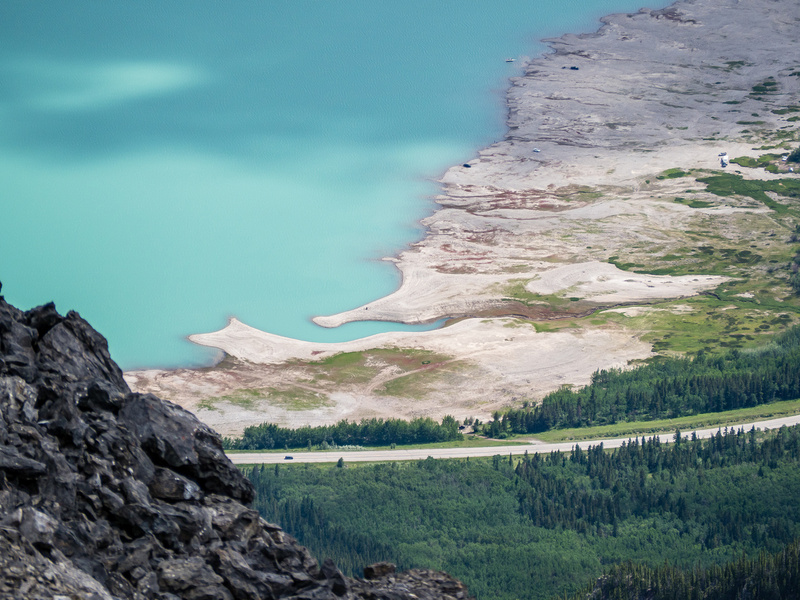 It’s definitely worth your attention if you’re a hiker, camper or peakbagger. 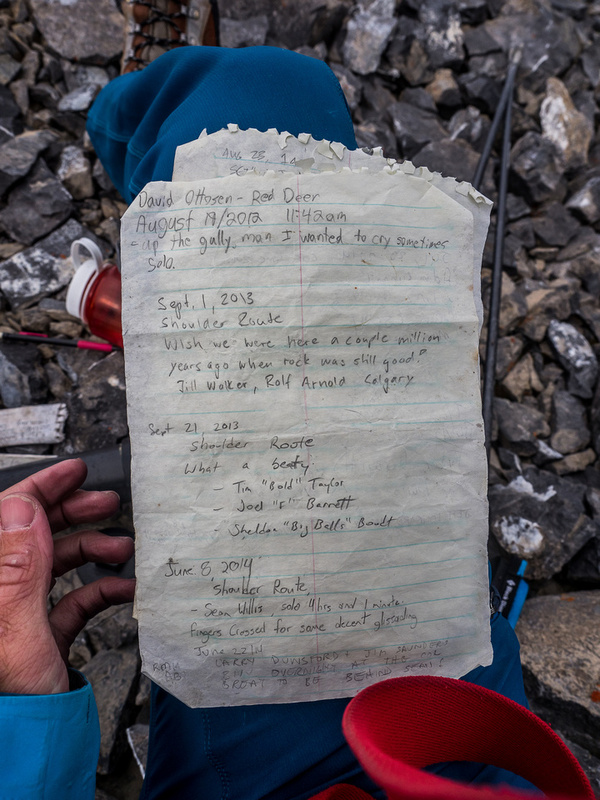 There aren’t many published scramble trip reports on Abraham Mountain, but the few that are online make it sound pretty arduous and exhausting. I couldn’t for the life of me, figure out why. It measures less than 11km round trip with about 1600m of height gain. There is no long approach and no mention of heinous bushwhacking either. How can it be such an exhausting trip? 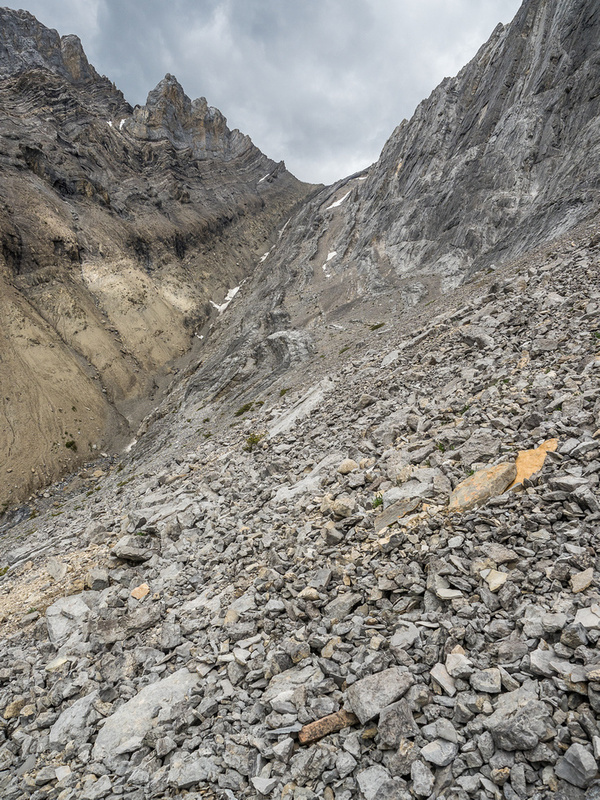 As for the rumored “Endless Scree Gully of Pain” – I figured that if scramblers don’t like scree they might as well either become hikers or climbers. Scree is a huge part of what we do isn’t it?! Being earlier in the season, I also hoped there’d be some snow on route. I heard from Mike Mitchell that he and Raf found a much quicker and more efficient route than either Eric or Josee had used, by staying in the creekbed until forced by the terrain to ascend up to climber’s right and join the route that others have reported skirting slabs beneath and cliffs above. 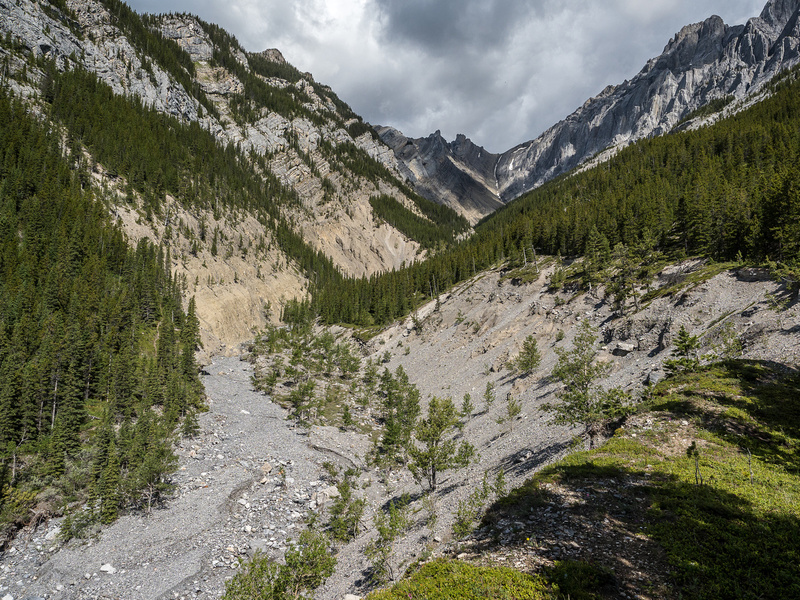 There was one sting in the tail for the creekbed approach which was an exposed traverse around a waterfall. I was keen to try making an efficient day trip out of Abraham and avoid as much difficult terrain as possible. 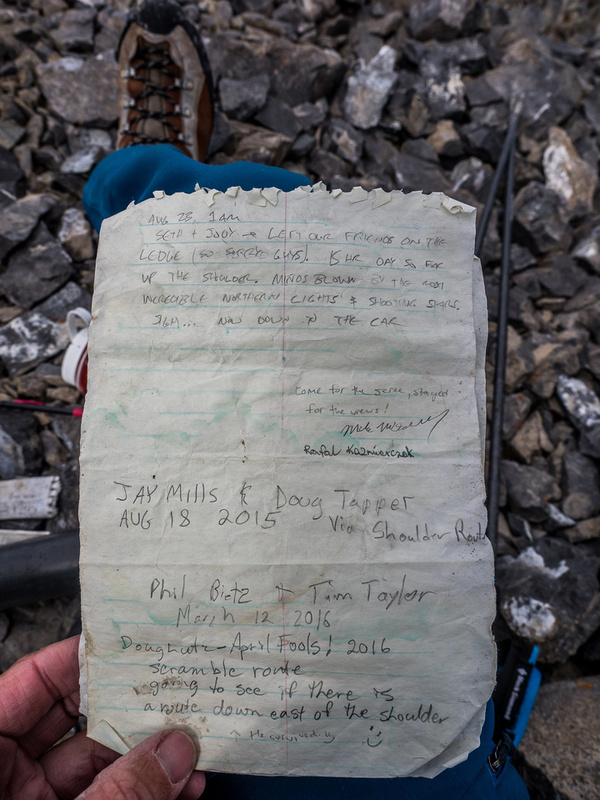 Some details on various published scrambling routes on Abraham Mountain. My route in red, the canyon approach in orange and the climber’s descent track in green. 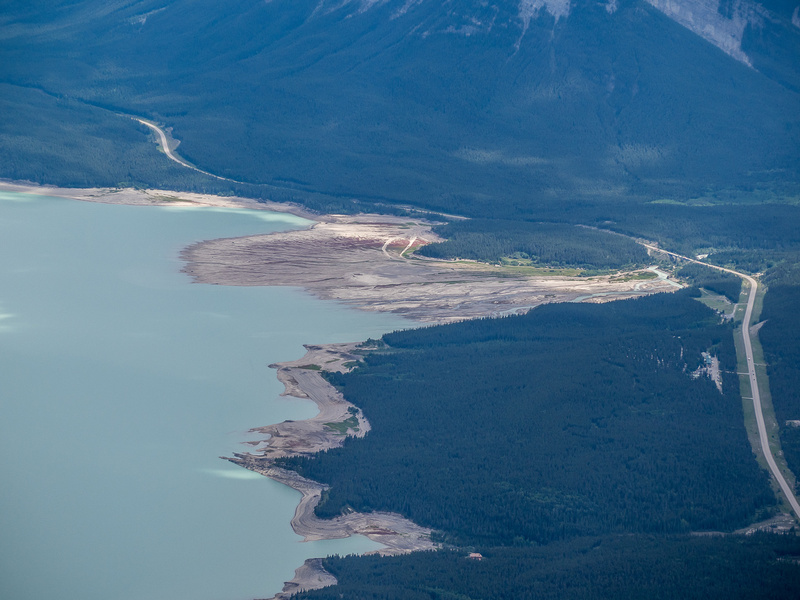 Note that all the approaches join up before the huge gullies on the SW side of the mountain are scrambled on top of. These gullies are treacherous. Do NOT gut sucked into them. 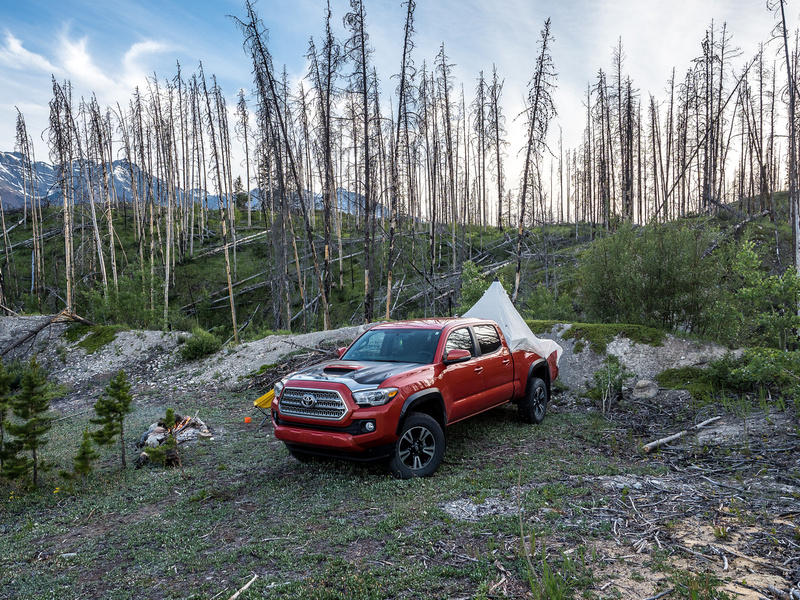 It was much later than I usually like to leave a trailhead by the time I was finally parking my truck alongside the David Thompson Highway. The air was humid and very warm at 11:00 as I struggled into my clunky, heavy scrambling boots and shrugged into my pack. I carried a liter of water just in case things were dry higher up, and also packed crampons and alpine ax in case of snow. There was absolutely no wind (very strange for DTC) and a band of clouds blocked the sun above me. I even felt a raindrop or two as I left the truck – something I wasn’t really excited about. I had no idea where exactly to leave the highway as I knew both Eric and Josee followed a climber’s trail up along obvious slabs high above the creek to climber’s right (west of the standard SE ridge alpine route). I also knew that Raf and Mike had gone directly up the obvious creek running below the SE ridge. So, with indecision on my mind, I naturally took an ascent line between both known routes. The following map details the various routes and shows my approximate line (in red). I say “approximate” and urge you to use caution with my GPX file simply because the tight confines of the terrain on this scramble made my GPS track quite random in places. 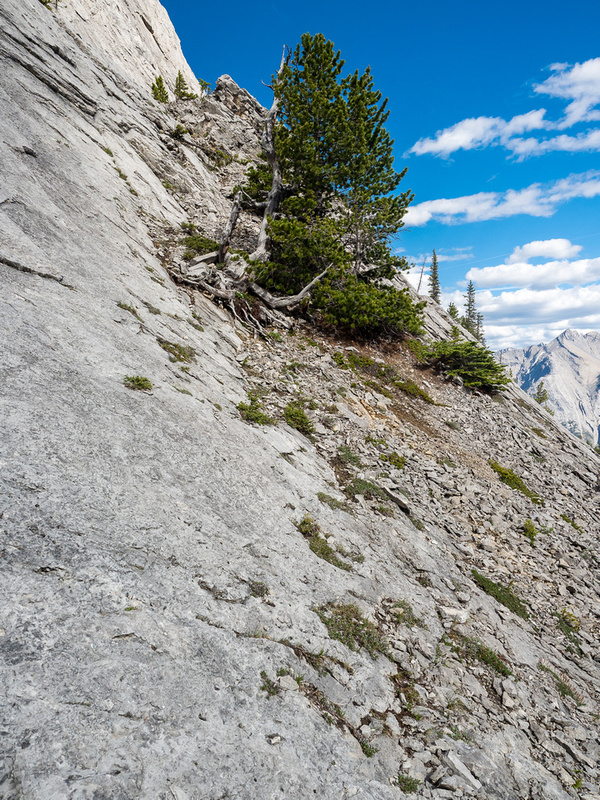 The nature of the terrain on Abraham is that even being 10 or 20m off the optimal line can put you on difficult, exposed slabs or cliffed out somewhere. Route finding is KEY to enjoying this trip!! 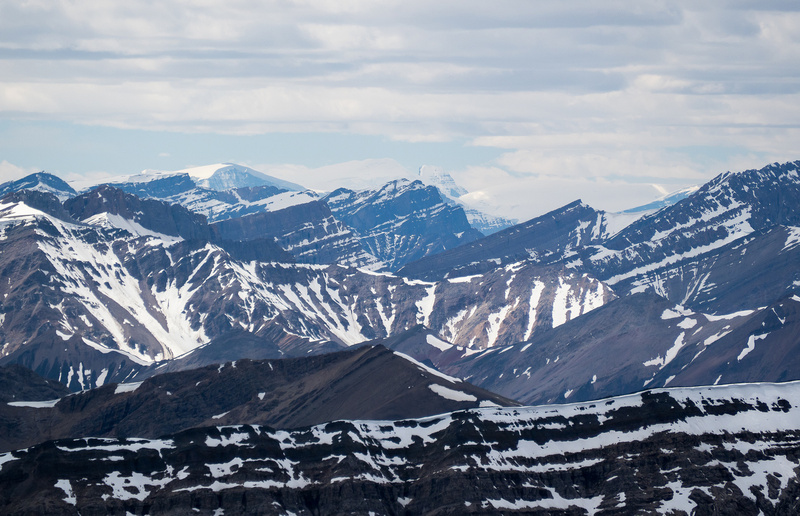 From near the David Thompson Highway – my route at left, the higher traverse route at right. There was a light trail on climber’s right of the creek bed, which I followed from the bridge along the David Thompson Highway. The track stuck above the creek so I gladly followed it. I could spot the other (climber’s descent) route high above me to the right and was very glad not to be gaining height quite that quickly. It was bloody hot. There’s a reason I like to be on summits before noon. Other than the heat I was enjoying myself immensely as I followed the light track and then at a washout, a very lightly forested ridge that got higher and higher above the creek. I was starting to wonder about my route choice when I bumped into my first major obstacle. A huge gully blocked my path with no clear or easy way across it or around it. I knew from Mike’s GPS track that he and Raf and ascended a ridge one gully further, but I had no way of getting there without losing a TON of elevation. I threw some mental dice and decided that I knew there was a route high above me, so why not try to reach that instead of descending and re-ascending? I had no clear idea if my route would go. There was cliff bands running above me the whole time, even in the treed terrain. You might be tempted to traverse straight across some sections, but look carefully before proceeding to make sure you’re comfortable with the entire crossing before committing to it. I got lucky. I managed to find one reasonable route that ascended steep, moderate scree-covered slabs before running into my first cairn and the remainder of the traverse to the back of the access valley. Despite the fact that there was the odd cairn marking the route, it wasn’t quite as obvious as I was led to believe. I think random cairns are built by various folks navigating this terrain to assist them, but there’s no guarantee that a cairn means the one correct route. Every once in a while I would be tempted to cross into a slabby gully only to rethink it once I got closer. The exposure was severe in spots and a slip would not be cool. Slabs are fun until they’re not – and then they’re really not! Especially in DTC you have to learn to resist thinking that all slabs are “easy”. 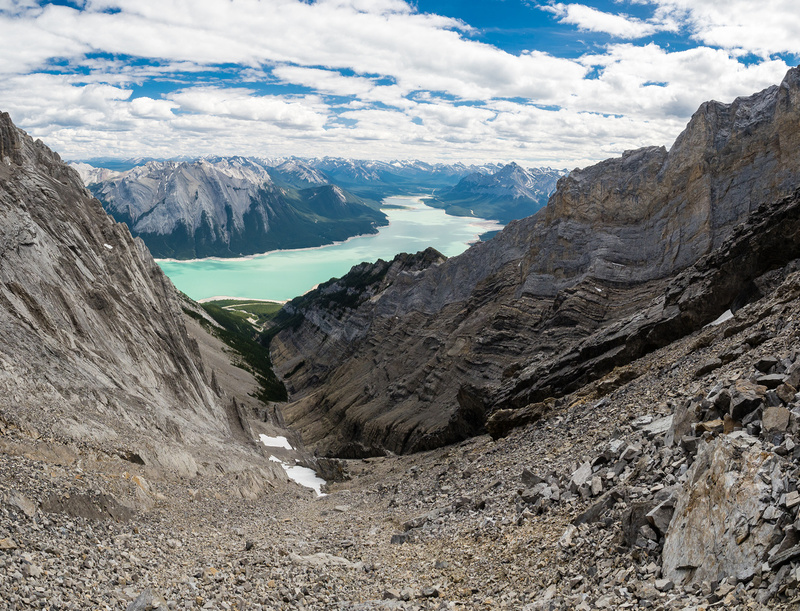 Despite appearances, often when you get halfway up or across the slab you’ll realize it’s either more exposed or much less slabby and more scree than you bargained for. 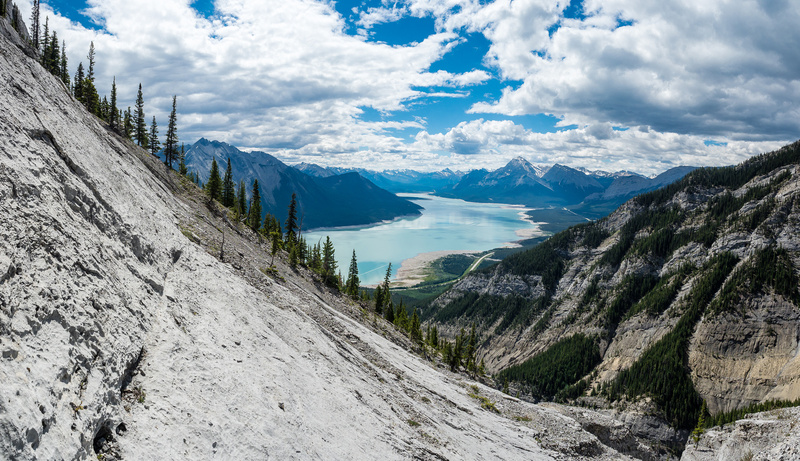 Generally, when in doubt I usually ended up going up to the cliffs above and finding a reasonable route that way. Eventually I found the same interesting downclimb along the top of an exposed, slabby section as Josee’s group did, which led across yet another drainage. 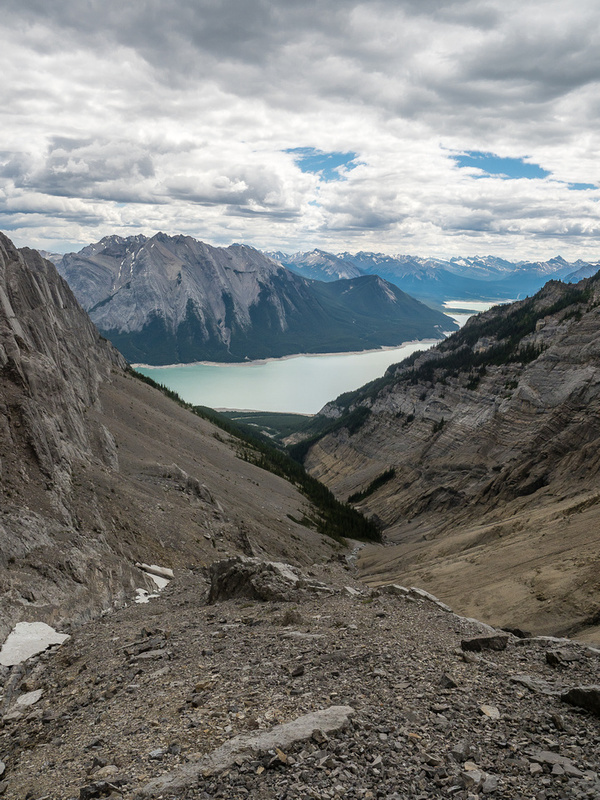 Looking back from the bottom of the downclimb (upper left) with great views over Abraham Lake and an idea of the exposed, slabby terrain the route traverses over. 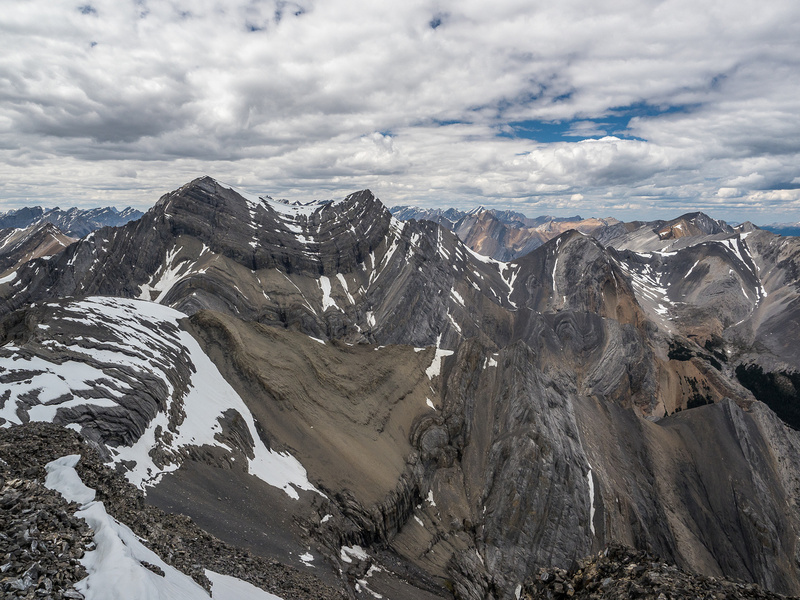 After entering and traversing some light forested ridges and gullies, I finally sensed that I was getting closer to the back of the approach valley and bottom of the scree / snow gully to the summit ridge. 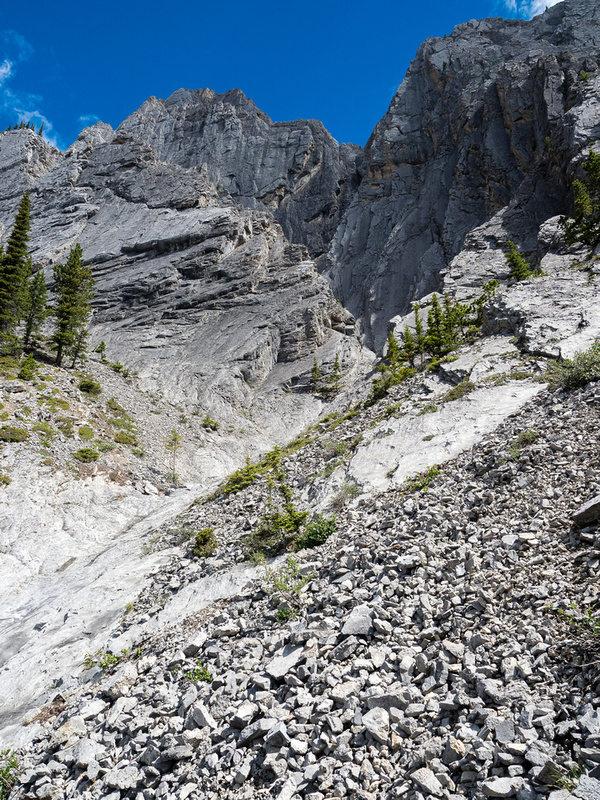 There are at least 6 major gullies and some other smaller ones that you must cross on the traverse along my route. There should never be more than moderate or even easy scrambling moves required if you are careful about route finding. If you blindly cross every gully at the point that you meet it you will be taking unnecessary chances and increasing the rating of the trip considerably. Even when I was convinced I was done traversing gullies, I still had 1 or 2 more shallow ones to cross before finally spotting a nice level spot just before tackling the huge scree / snow gully at the back of the valley. Finally nearing the scree gully. Note the ‘small’ snow patch near the ‘top’? It’s not small and that’s not the top. 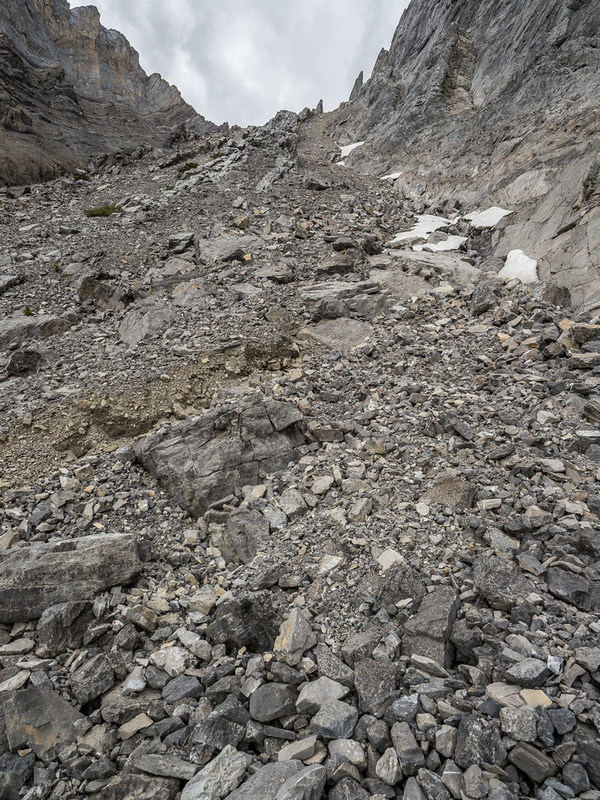 The scree / snow gully wasn’t nearly as awful as some reports make it sound. Again I ask – why would a scrambler complain about scree? It’s like a climber complaining about exposure – it’s part of what we do for fun – isn’t it? Sure! It can get annoying sometimes, but at the end of the day, laboring up a chossy pile of rock is exactly what a Rockies scrambler does on a very regular basis for fun. This gully was much friendlier than the one on Elliott both in terms of how ‘solid’ the scree was and in terms of the snow patches that helped me immensely on both ascent and descent. 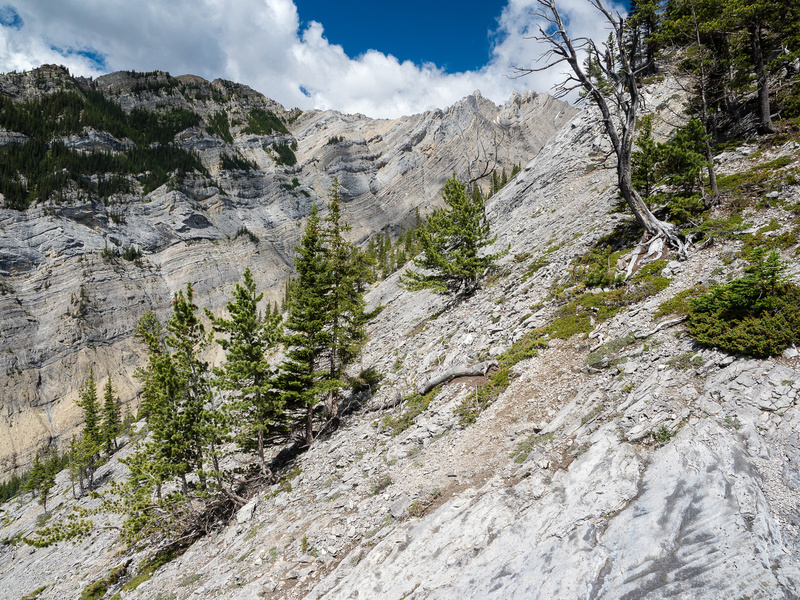 The only exposure in this gully is back down – nothing like the cliffs beneath me on Elliott. Just as on Elliott, however, is the foreshortening. I thought the gully would be a lot quicker than it was. 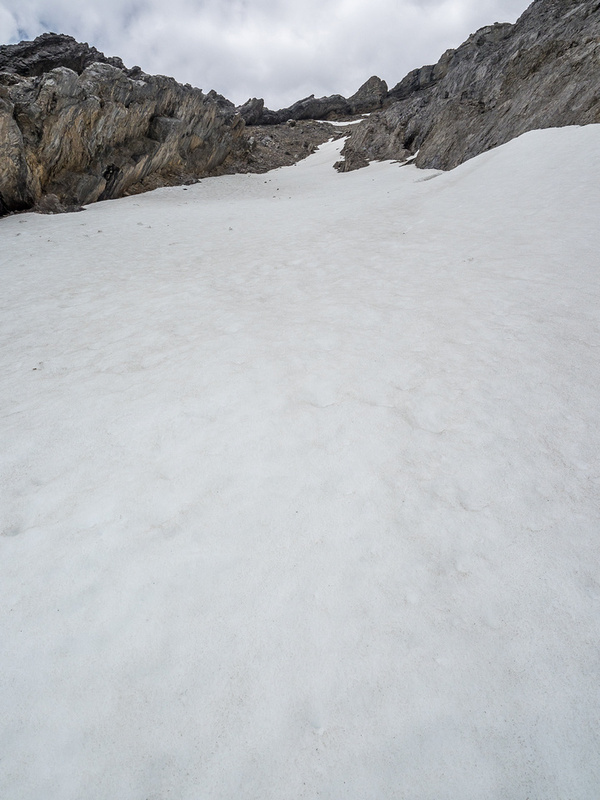 The snow patches that looked pretty small from below, were actually a few hundred meters long. When I finally approached the top of the gully I was ready for the traverse to the summit. The dark clouds that were hanging over me all day were looking more and more like they could rain or thunder. 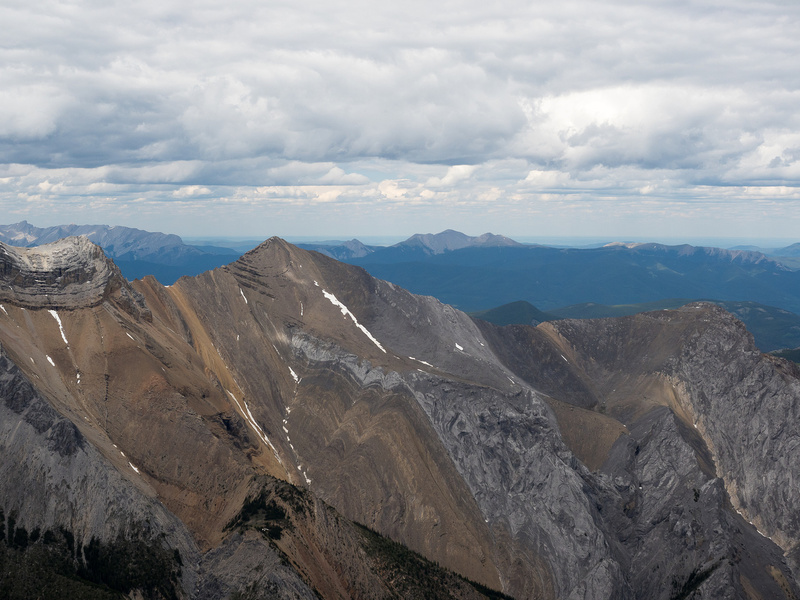 The strange part was the absolute lack of any winds – there were patches of blue sky all around me, but the dark cloud over Abraham Mountain wasn’t moving an inch! I was wondering about the final ridge to the summit of Abraham. Both Josee and Eric talk about an “unnerving” section. Mike didn’t mention this and neither had someone else who’d reported back on it so I wasn’t sure if it just wasn’t that bad, or if there was a way to bypass the difficulties. On the west ridge with the summit in view. 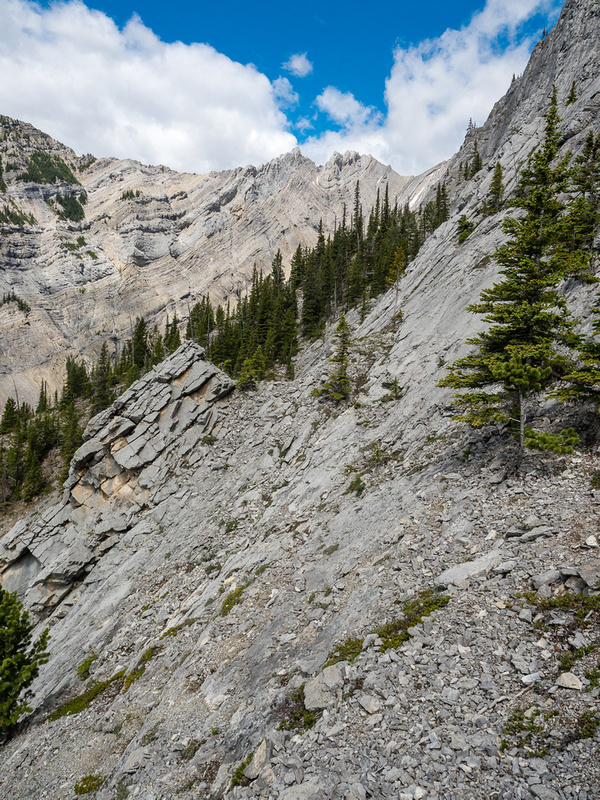 As I groveled up the last bit of scree before a fairly blank rock wall guarding the ridge top above the scree gully, I decided to grovel a bit further to my right (SE) along the base of the ridge, to see if there was a bypass. Once again, I got lucky. There was a very straightforward bypass around any difficulties on the ridge. 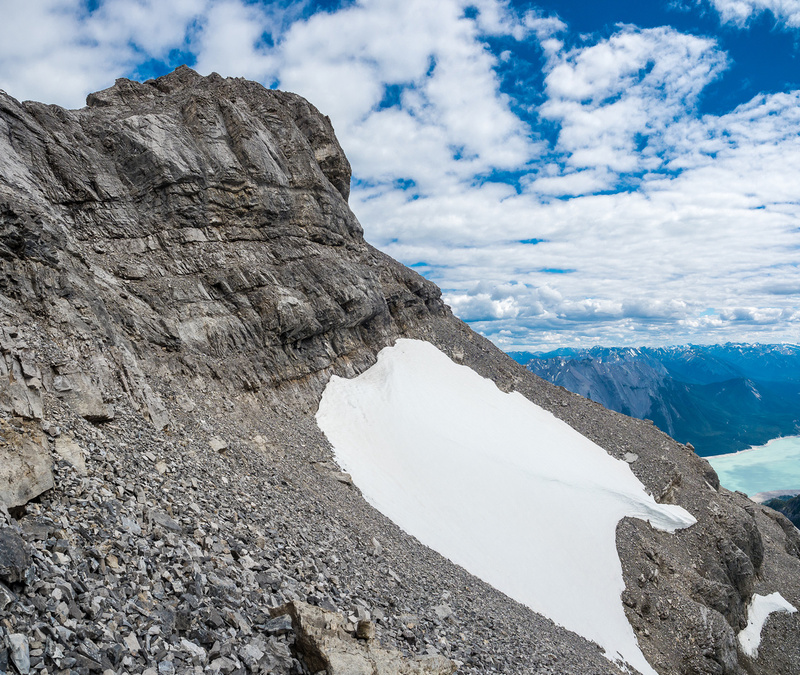 Soon I was angling up easy slab / scree to top out on the final few hundred meters along an easy ridge to the summit block. The summit block was easy scree and within about 4.5 hours of leaving the truck I was standing on top of Abraham Mountain with stunning views in every direction. There wasn’t a breath of wind on the summit. 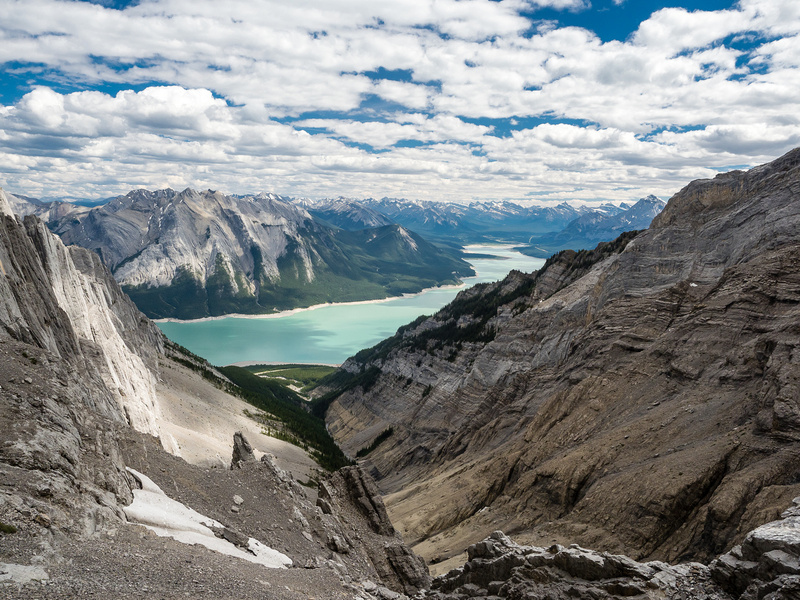 I enjoyed the stupendous views – especially over Abraham Lake – taking time to hydrate and read the sparse pieces of paper which were all that remained in the summit register. Because I had to find a camp site yet for the evening and wanted to get some rest before Mike and my attempts at some summits around Stelfox, I didn’t linger too long at the top before heading back down. 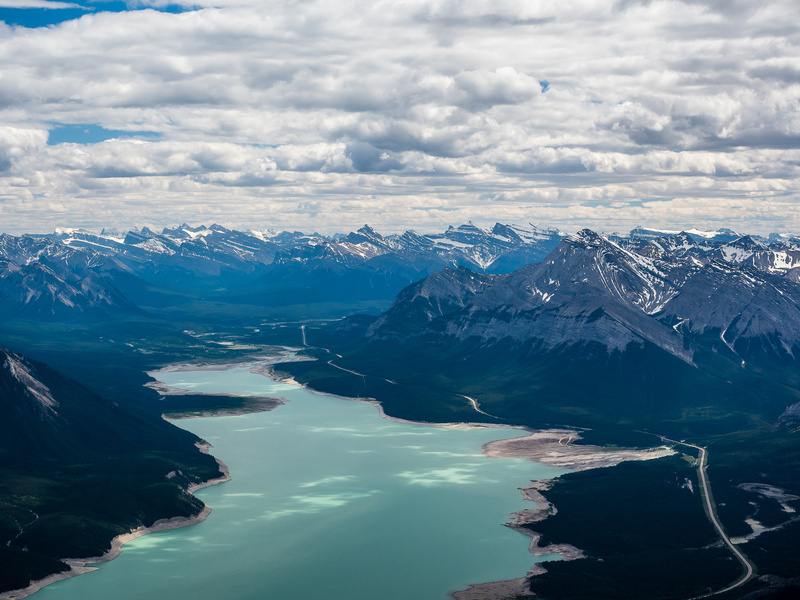 Stunning views from the summit over Abraham Lake. Allstones Mountain is obviously higher than Abraham. The descent went pretty well, thanks to the many cairns I’d placed along the route to remind myself of the various dips, doodles and little access gullies I had to find back. If I didn’t leave at least half a dozen cairns in critical spots the descent would have been pretty frustrating. The route isn’t always obvious despite me looking back often and trying to remember key landmarks. My GPS track from the ascent also didn’t help much because it was jumping around so much in the tight terrain. But all went well in the end and I was quite surprised to be walking down the final easy gravel slope to the highway within 7.5 hours of leaving the truck! This was far quicker and more expedient than I was expecting and moves Abraham Mountain into the realm of a very normal day scramble for many folks, provided they are good at routefinding and OK with the elevation gains. Interesting terrain near the bottom of the descent gully. 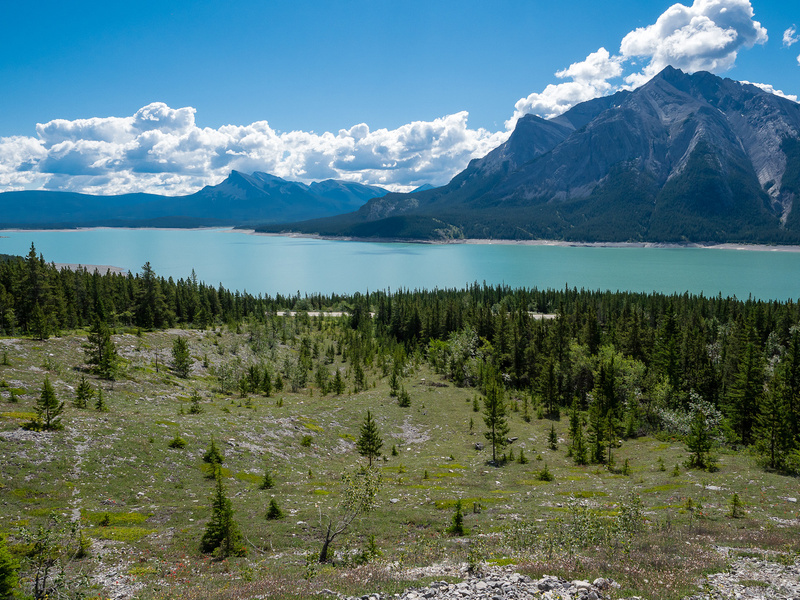 Great early evening views out over Abraham Lake towards Elliott Peak on the right. Honestly, Abraham Mountain was much more enjoyable and pleasant than I expected. 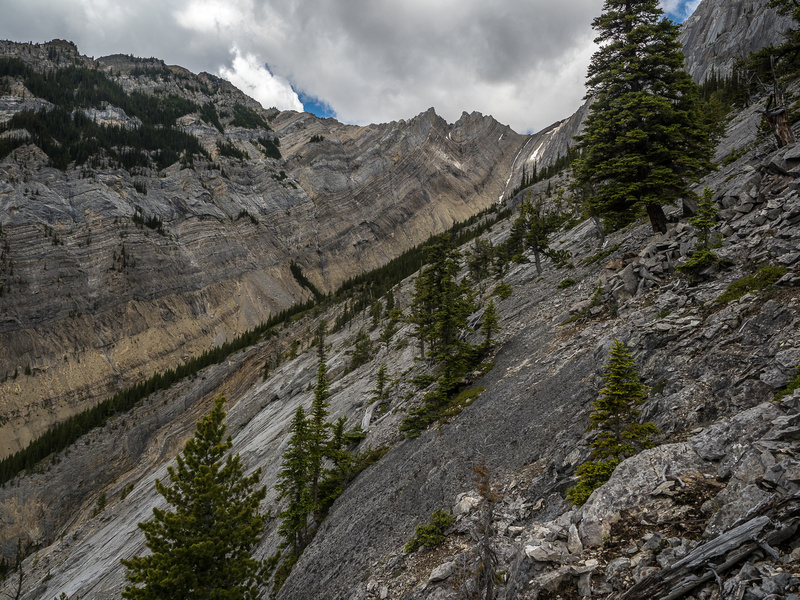 It’s moved up to my favorite scramble in the David Thompson corridor for now. It has all the elements that make a scramble worthwhile IMHO. Intricate routefinding that makes a huge difference in the difficulty and total times for the trip. 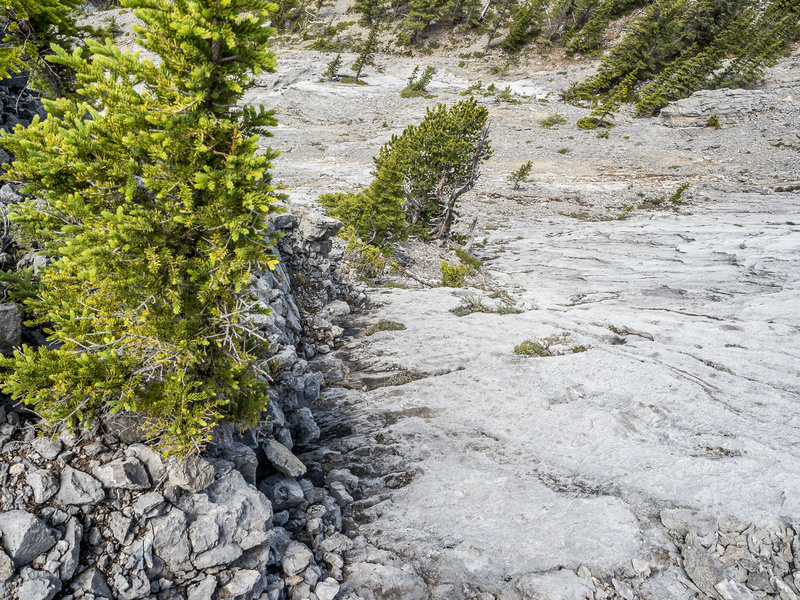 Varied terrain such as gullies, light forest, cliffs and snow. Gorgeous views all day and especially from the summit. No approach and a feeling of remoteness even though it’s only a few kilometers from a busy highway. I highly recommend this scramble. 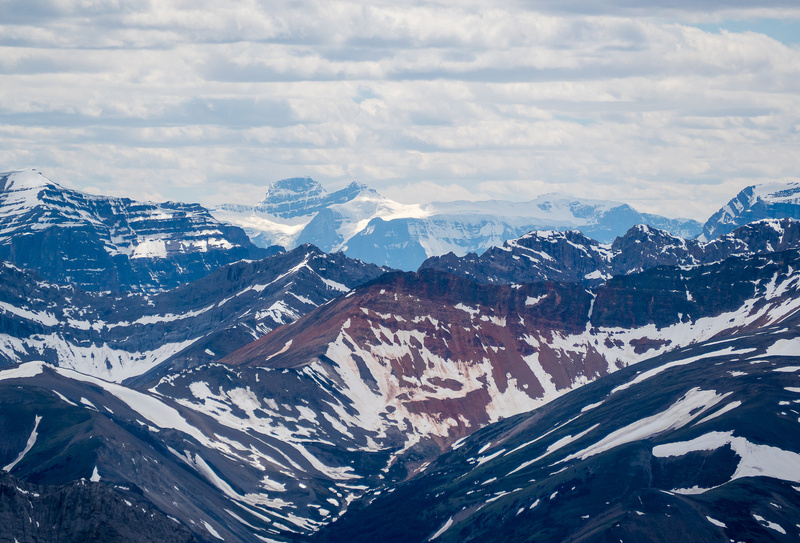 From near the David Thompson Highway - my route at left, the higher traverse route at right. Looking back towards the lake and highway from the start of my route. The higher traverse out of sight to the left, the creek out of sight to my right. Looking back from the end of the traverse around the first washout. 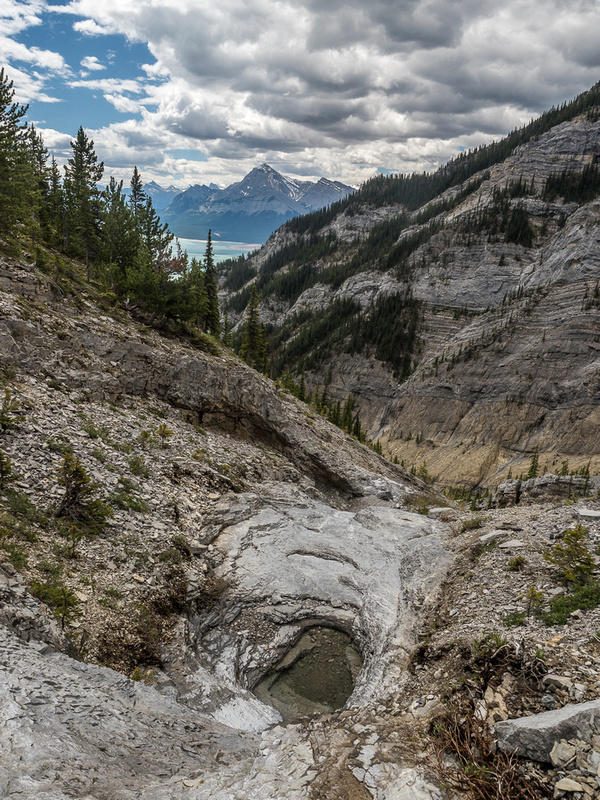 The first major drainage that blocks easy access to the back of the valley. 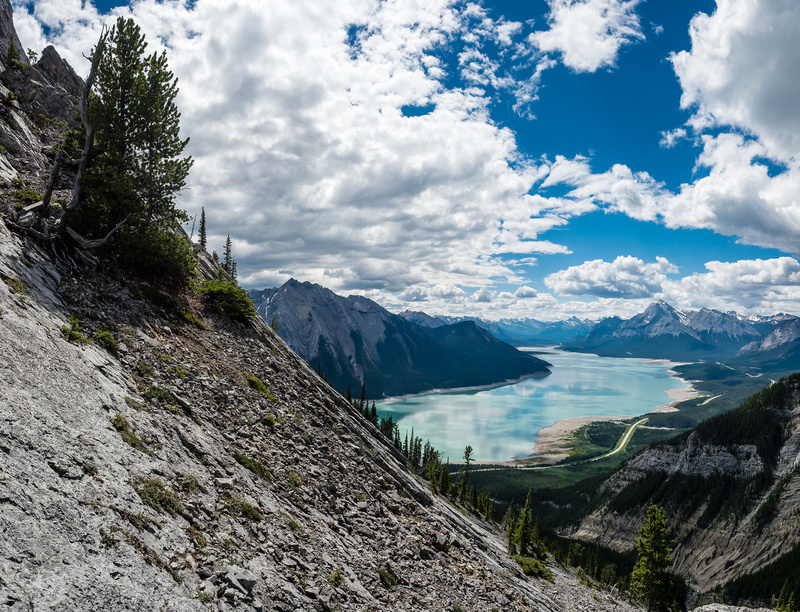 It's a gorgeous day as I look back over a calm Abraham Lake. I came out of the forest at lower right here. You might be tempted to traverse straight across some sections, but look carefully before proceeding to make sure you're comfortable with the entire crossing before committing to it. Looking up at the cliffs that block me on the high side of the traverse. 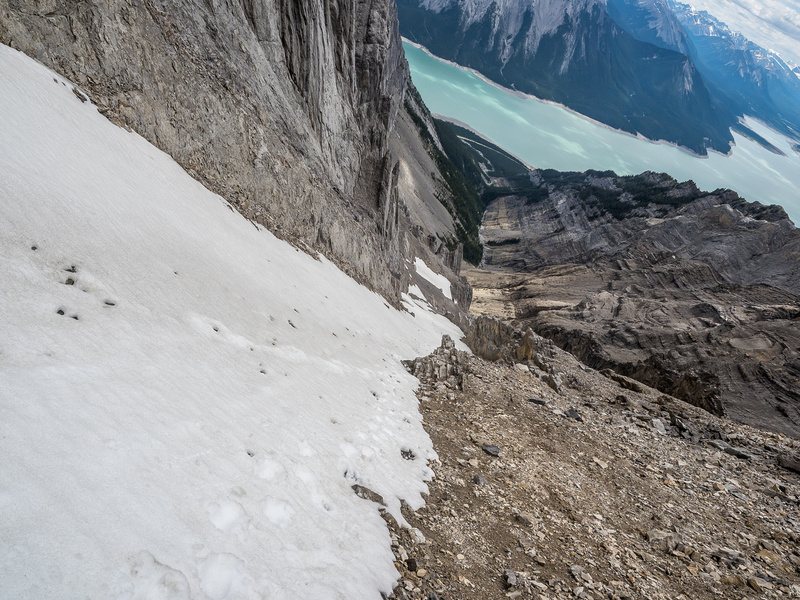 A short traverse to the top of the narrow downclimb. The moderate downclimb along the traverse. Looking back along a crack in the slab that I just crossed. More gully terrain with a pool of water waiting to catch me. Too bad it's only a few feet deep! Finally nearing the scree gully. Note the 'small' snow patch near the 'top'? It's not small and that's not the top. 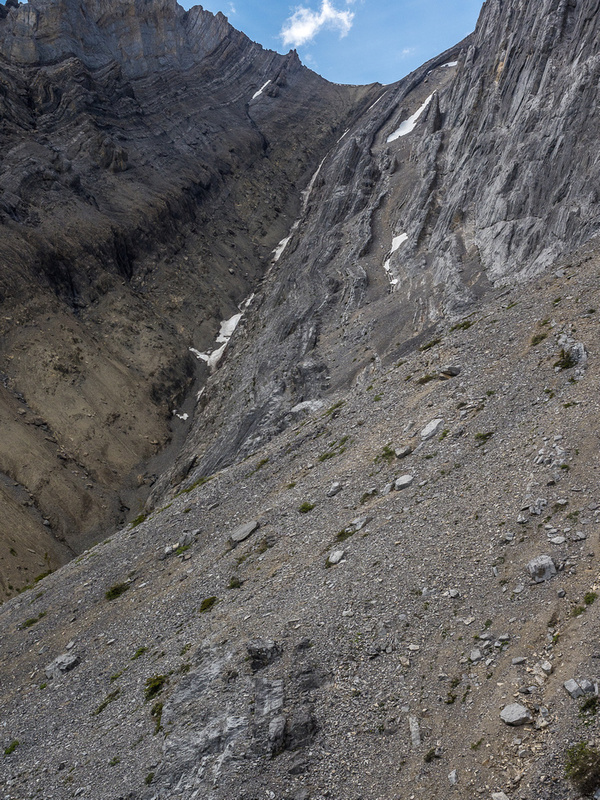 The scree gully slowly curves up to the right. Looking down the gully from near the start of it. The snow patch is more of a snow field. 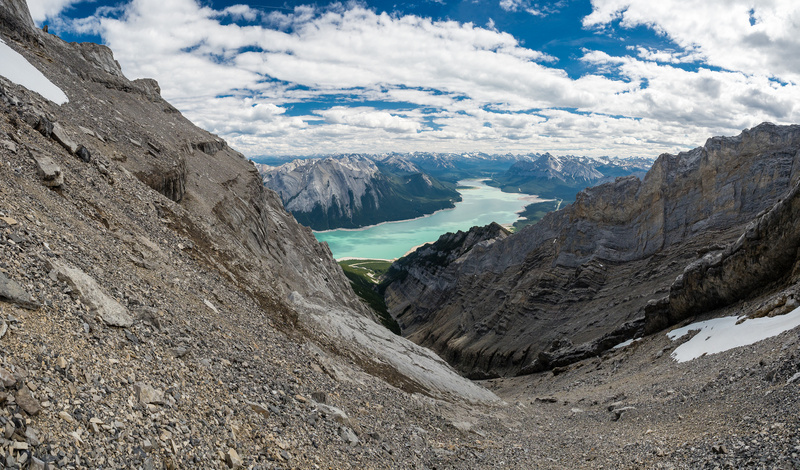 Doesn't look so small now - looking back down from part way up the snow patch. The snow patch that I traversed along the top of and around the far corner before finding an easy route to the ridge above me on the left. 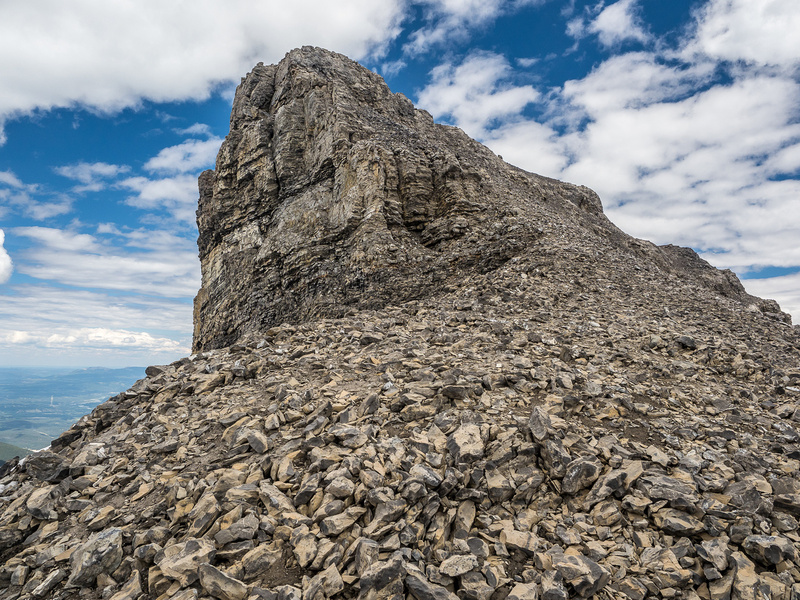 The interesting summit block - just easy scree despite appearances. Looking NW towards the taller Allstones Mountain with Vision Quest at left and Windy Point Ridge at right. Allstones Mountain is clearly even higher than Abraham. 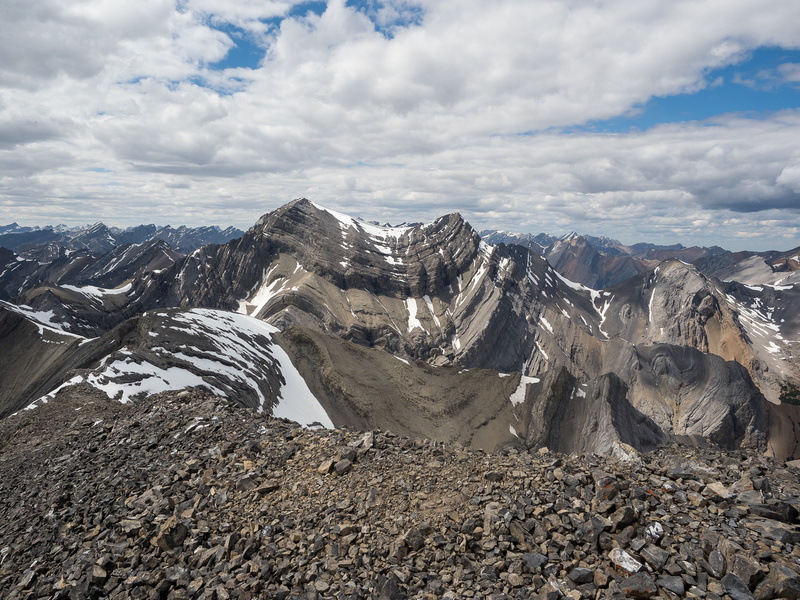 I suspect this might be the summit of Windy Point Ridge - the highest one which is named Talus Peak. 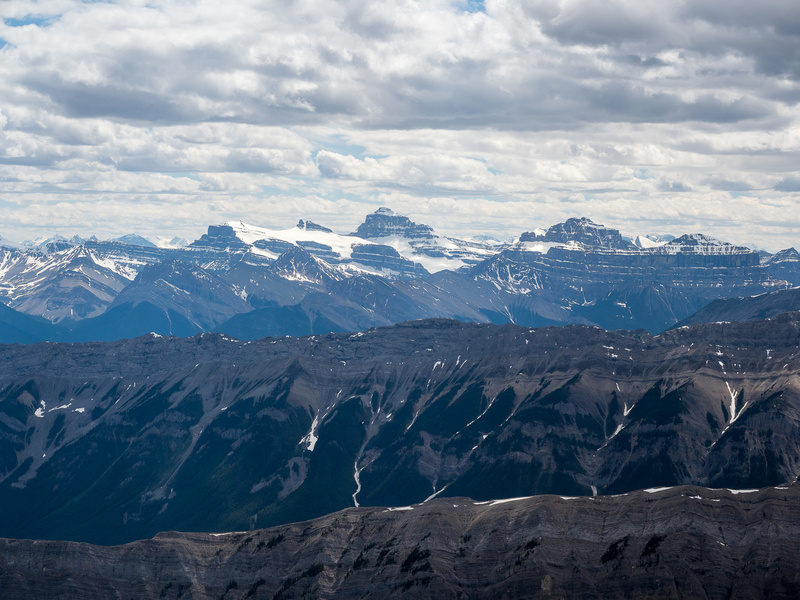 Views towards Lioness, Lion (Resolute), Cline and the White Goat Peaks (L to R). 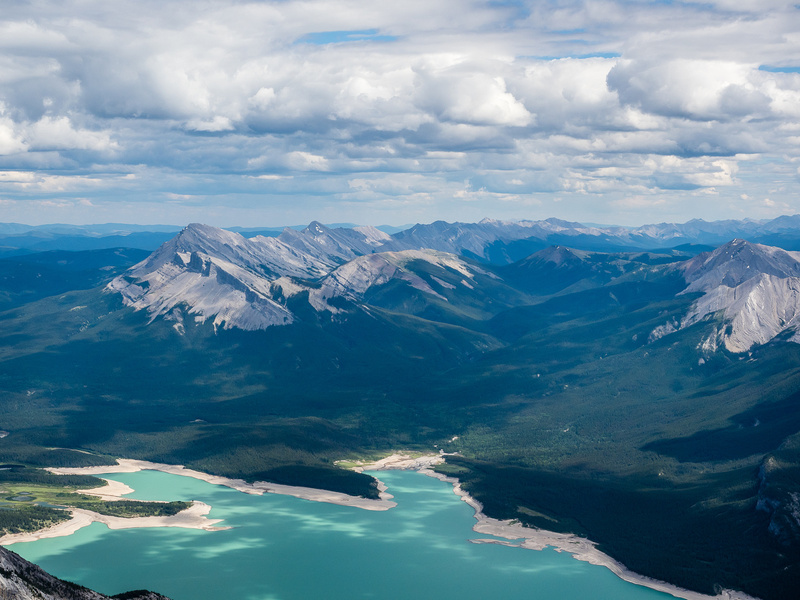 Looking down to the south end of Abraham Lake with Elliot and Sentinel on the right and Siffleur, Peskett and Loudon at distant center. Looking east towards Kista Peak. Elliott and Sentinel across the Cline River. North Twin and Twins Tower show up - barely visible. The earthworks around the exit of the reservoir are interesting from this vantage. People are enjoying the beautiful, calm shores of the lake on this particular day. 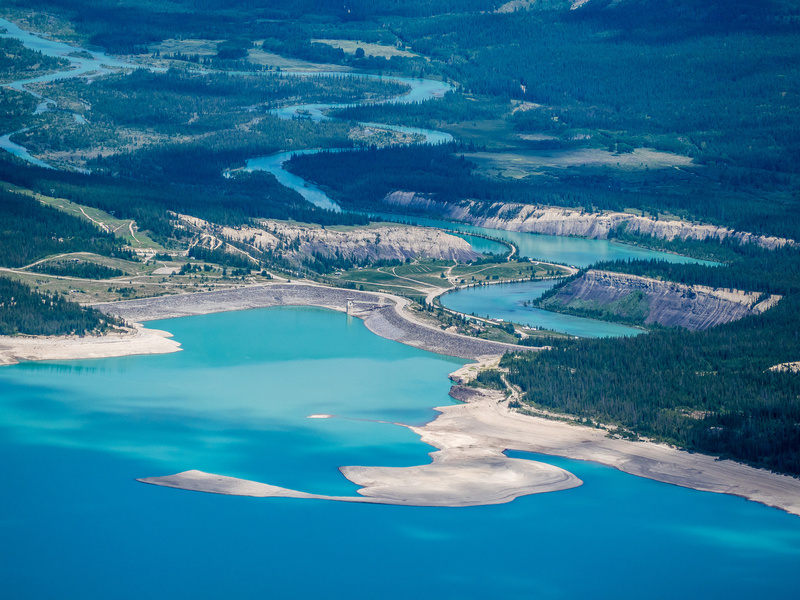 Next to the North Saskatchewan River, the Cline River is the biggest contributing water source to Abraham Lake. Funny how one guy soloed the shoulder route in 4 hours and many other entries indicated two or three times that just on ascent! 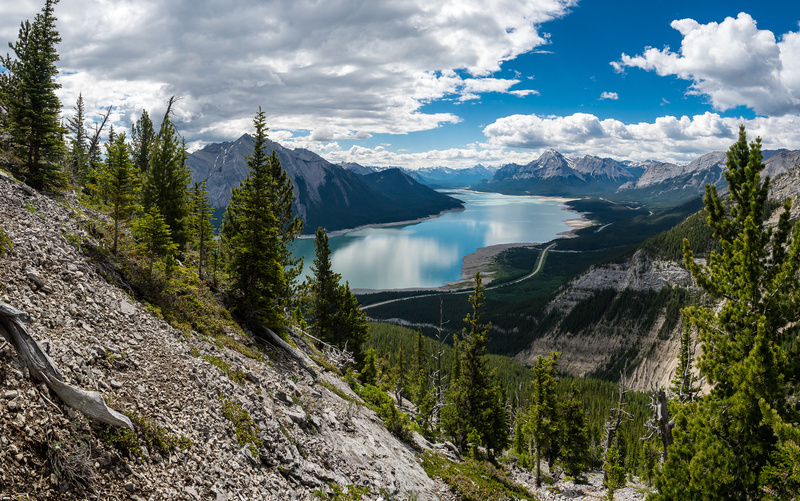 The views from a slightly lower outcrop just under the summit are even better with regards to the lake. There are rumors that another easy route is via the valley to the bottom right via Allstones Creek. 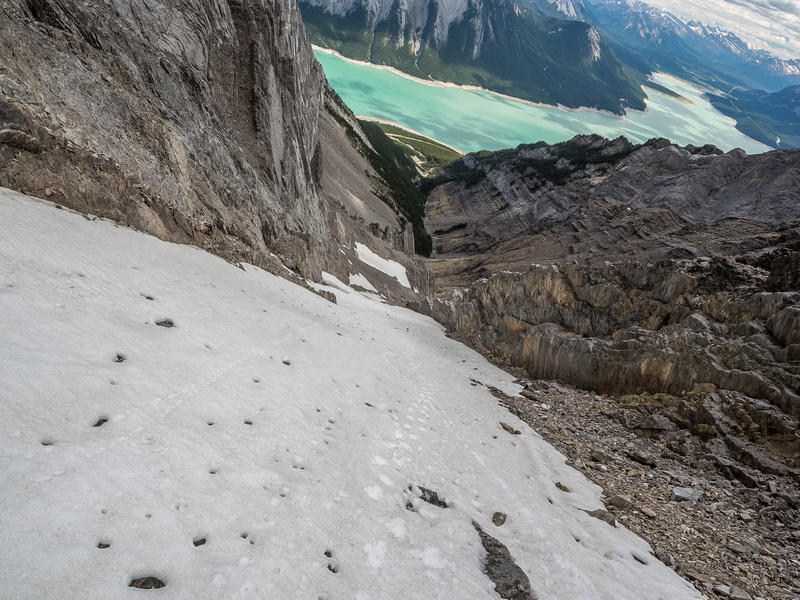 Ready to descend the snow / scree gully - note the snow patch visible at upper left which I crossed on top of. Fast travel down this section! Interesting terrain near the bottom of the gully. 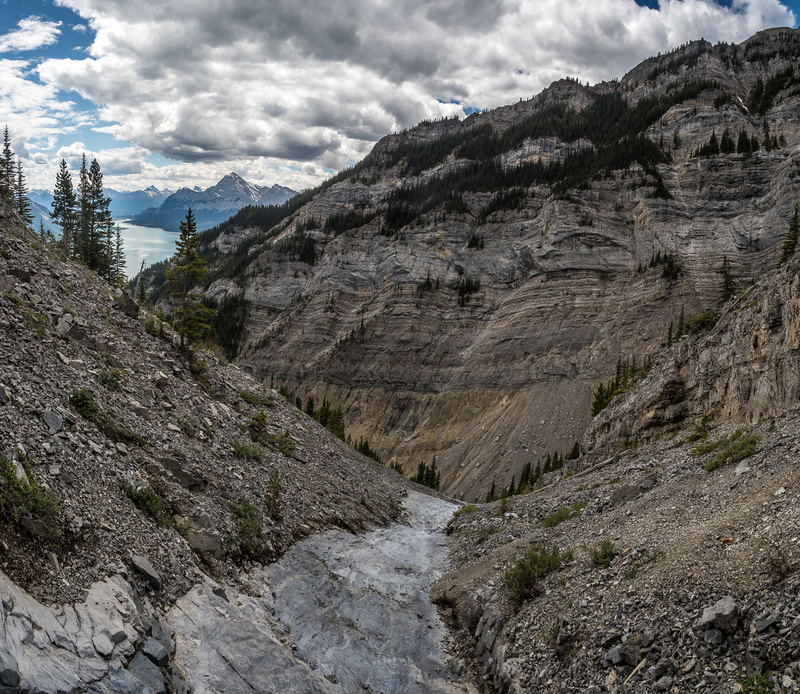 Looking back at the gully, it's crazy how foreshortened it is. A familiar section of the traverse - I have to ascend this crack before traversing above slabs.